A convenient and comprehensive 24 credit hour course approved for both Measurement & Mitigation professionals. This course builds upon NRPP-45B with additional review questions and assignments. A convenient and comprehensive 24 credit hour course approved for both Measurement & Mitigation professionals. This course builds upon NRPP-45B with additional review questions and assignments. Students listen to the audio and complete the online quizzes. There is approximately 24 hours of coursework, including listening to audio instruction (in short audio tracks so you can listen to as many or as few as you want at any time); online resources such as videos, protocols, and publications; and quizzes that are taken as you progress through the course (not timed and may be taken unlimited times). There is no time limit for taking the course, and even after completion you continue to have access to the course in order to refer back to resources. Karen said: The course was broken into sections that made it easy to take the course over several days. Also, the quizzes added extra information on the topics. Dr. said: VERY well done! An EXCELLENT measurement and mitigation review! Jeremy said: I was worried that the audio tracks would be of poor quality, but they are actually really good. Brittany said: The specialist interviews were especially helpful. 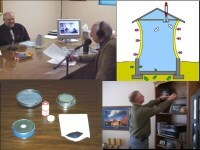 I will highly recommend this course to others looking to begin a career in radon testing. Great job! Damian said: Well done. Only would suggest active video to be included with Power Point slids if possible. Jon said: very helpfull, professional staff. John said: Course was excellent. Learned a lot of information. Caleb said: Doug Kladder is the best in the industry. Thank you for your continued assistance in my radon career. John said: Very comprehensive and beneficial. Joseph said: Very thorough and easy to follow. Richard said: This course is perfect for the radon professional who may have difficulty taking time out of their schedule for an on site course. Chuck said: You've made the process straightforward and much move convenient than attending a seminar every two years. Robert said: Very good course, thank you for having it online for us busy business owners, husbands, fathers. Kevin said: The course is a great way of keeping important information accurate in a persons memory. Derek said: This course is highly recommended for the comprehensive information it provides and the ability for remote study.